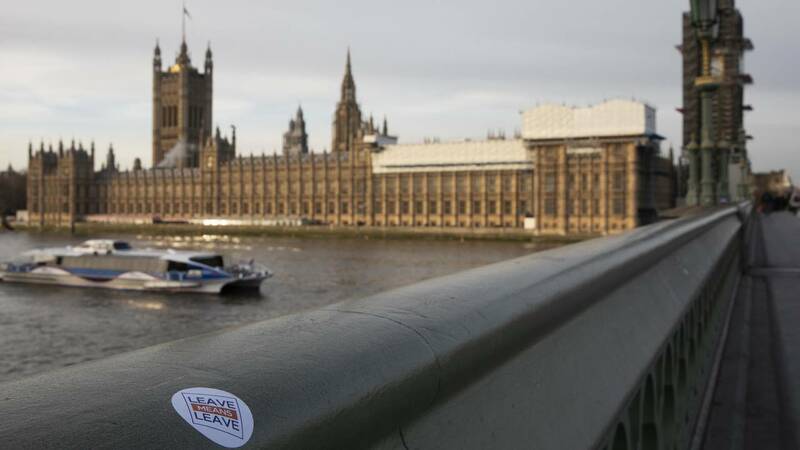 A 'Leave Means Leave' sticker on Westminster Bridge near the Houses of Parliament on January 18, 2019 in London, England. British Prime Minister Theresa May is to present her 'Plan B' Brexit deal to MP's on Monday after her first attempt failed. (CNN) - An influential cross-party group of MPs is moving to wrest the initiative over the Brexit process from UK Prime Minister Theresa May. CNN has learned that they are planning to introduce legislation on Monday that would scupper the government's Withdrawal Bill and block a "no-deal" Brexit. The word in the Westminster corridors Friday was that this unprecedented cross-party "insurgency" was gaining strength. The government's "Plan B" -- which is due to be set out on Monday and debated in the House of Commons the following week -- would be rendered null and void if the MPs legislation were passed. Among the MPs behind the measure is the Conservative Nick Boles and Labour's Yvette Cooper and Hilary Benn. However, they and other supporters of the legislation will need to work with the Speaker of the House to get parliamentary time for their proposal. A critical part of the bill -- dubbed European Withdrawal 3.0 -- would postpone the UK's departure from the European Union on March 29 if parliament fails to agree on a way forward by then. That is the day on which Article 50 -- the timetable for the UK's withdrawal -- expires. Any extension would have to be agreed by the other 27 members of the EU. According to a research paper just published by the House of Commons library, the bill means that "the government would be compelled to request an extension of the two-year negotiating period under Article 50." It says "the drafters of the Bill specifically contemplate an extension of just over 9 months, from 29 March 2019 to 31 December 2019." The government has insisted that the threat of a "no deal" Brexit is an important element in its negotiating strategy with the European Union. Prime Minister Theresa May has consistently ruled out an extension of Article 50, though many commentators believe there isn't enough time for parliament to pass the necessary legislation to give effect to withdrawal by the end of March. According to the leaked transcript of a conference call, the British Chancellor or Finance Minister, Philip Hammond, told business leaders last week that the MPs' initiative would be "a sort of ultimate backstop if the work the government is doing in seeking to find a way forward fails to deliver." The MPs' initiative will not go down well with the leadership of either of the main parties. But it's a sign of just how fluid the situation is at Westminster, and how the usual rules are disintegrating as Britain hurtles towards exiting the European Union. The Prime Minister's Brexit deal was shot down by a historic margin of 230 votes earlier this week, with 118 MPs from her own party voting against it. On Monday, she must return to the Commons with a revised plan, but it's hard to see what concessions or amendments she could propose that would erode that huge majority against her. While there is a large majority in the Commons against Britain sliding out of the EU in a disorderly fashion, there's been no majority so far for an alternative to May's roadmap. European governments are stepping up preparations for the dislocation that would come with a no-deal Brexit and telling the UK that it must make the next move if it wants to break the deadlock. Dutch Prime Minister Mark Rutte said bluntly Friday: "It's now for the British to make clear what they want." Were it that simple. The President of the European Council, Donald Tusk, tweeted Friday that he had discussed with May "the next steps on the UK side." But there was no indication of what those might be. Some in Europe -- though a diminishing band -- still hold out hope that Brexit might yet be reversible. In a letter to the Times of London, Annegret Kramp-Karrenbauer, widely expected to succeed Angela Merkel as Chancellor, joined with other prominent Germans to write: "No choice is irreversible. Our door will always remain open." While Theresa May says her door is open to other party leaders, Labour's Jeremy Corbyn says he has no intention of walking through it. He has refused an invitation from May to talk about the way forward unless she rules out the prospect of the UK leaving the EU without a withdrawal agreement. It's this paralysis that has galvanized backbench MPs into trying to lance the boil. But those behind the putative insurgency are taking great risks. Flouting party discipline in the UK parliament rarely goes unpunished. And some Remainer MPs on the Conservative side are already facing calls for their deselection ahead of the next election -- whenever that may be. Nick Boles told the BBC Friday that about 100 party activists in his constituency wanted him deselected. The Conservative Party has been ravaged by the issue of Europe ever since Britain acceded to what was then the European Common Market in 1973. The current divisions are so profound and bitter that the party could be rent asunder. Conservative MPs involved in the move to exclude a no-deal Brexit seem ready to abandon the party line for the sake of unlocking the impasse at Westminster. They may even garner support from some junior ministers. Others on the Conservative benches think the move is irresponsible. One MP within the Prime Minister's party frustrated with this attempted power grab told CNN: "I cannot think of any precedent for Parliament giving itself control over the government. It is genuinely historic. We used to take power from kings and peers and now we are arguably taking it away from the British people, and we are doing it in an arbitrary way because we do not like what they have said." Any many on the Brexiteer side of the party believe an extension of Article 50 opens the way to a "softer" Brexit that would tie the UK to the EU in ways they'd find unacceptable -- and even provide space for a second referendum. This same faction is reminding the Prime Minister of what happened to one of her predecessors. In 1846, Robert Peel passed legislation on free trade that the majority of his Conservative colleagues opposed. "This left the Conservatives out of office for 28 years," noted one of May's leading critics and a prominent Brexiteer, Jacob Rees-Mogg.